What’s so great about s’mores? For me, I love the gooeyness of the chocolate and marshmallows, all smooshed together and oozing out from between the graham crackers. So messy and sticky, but worth all those melty strings of chocolate and marshmallows dangling on your chin! Haha! 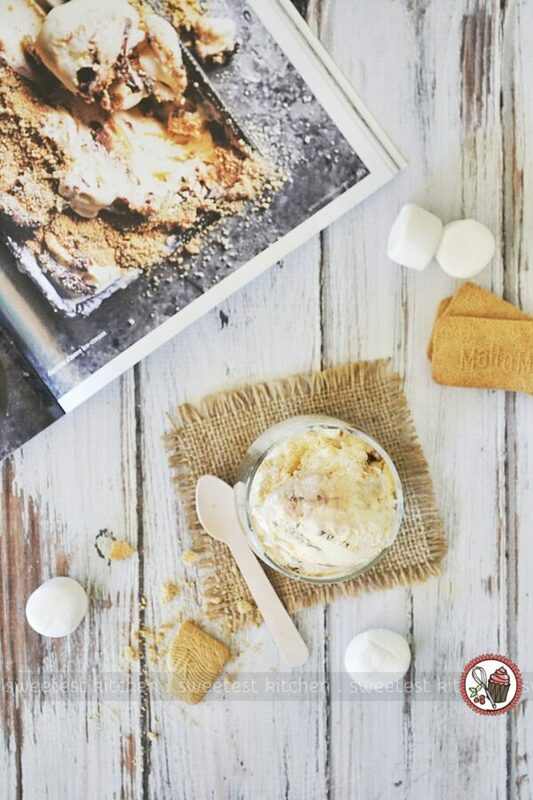 This recipe for s’mores ice cream is just as delicious as s’mores straight from the campfire, but without all the sticky mess! And guess what? It’s so easy; you don’t even need to use an ice cream maker or take it out of the freezer a dozen times to stir it! You’ll just need some store-bought – but really good quality – vanilla ice cream, good quality chocolate, graham crackers (or malt biscuits, if you’re in Australia), delicious marshmallows, milk and some cream. Basically, you’ll be making a chocolate ganache, melting the marshmallows, crushing some graham crackers, and then swirling these three classic s’mores components into the softened vanilla ice cream. You can eat it straight away, if you’re a lover of soft ice cream, or pop it into the freezer for a couple hours to firm up. 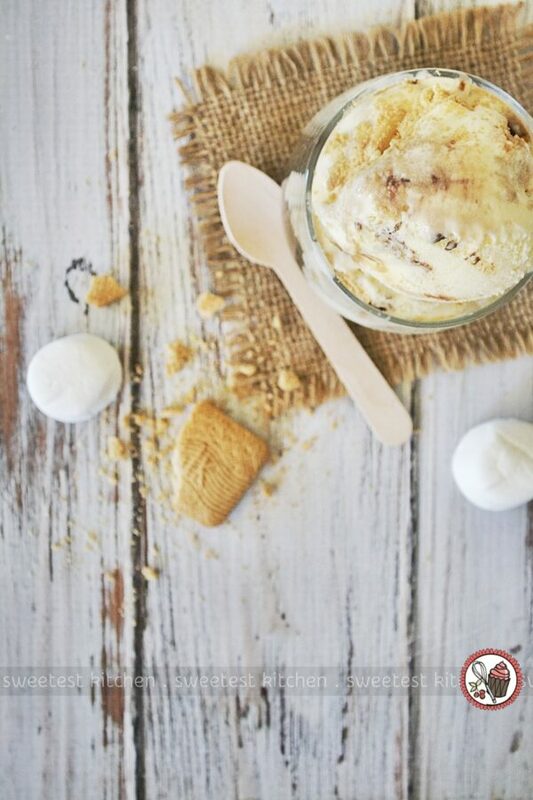 If you’re one of those people who think that making your own ice cream is just way too hard, try this recipe! Especially if you love s’mores. In fact, you don’t even need to make s’mores ice cream. Make cookies and cream ice cream by folding through crushed Oreos instead, or stir through some chopped fruit or fruit puree. You just can’t screw it up! For those of you in the US, where summer is just around the corner, this will be perfect for you! Try it for your family barbecues and Independence Day celebrations! 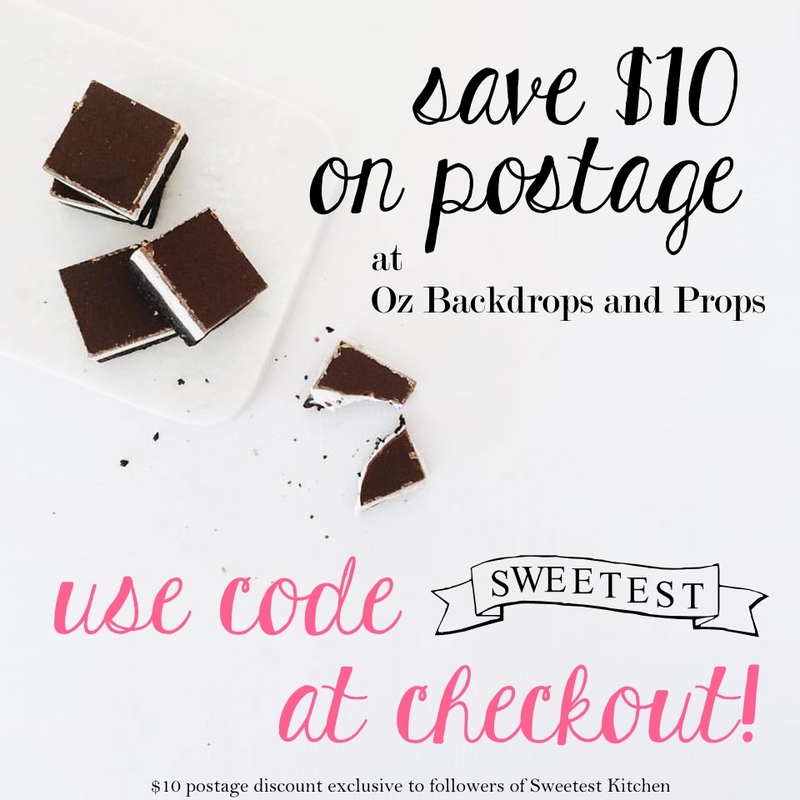 If you make it, let me know – leave a comment or tag your photos on Instagram with #sweetestkitchen! 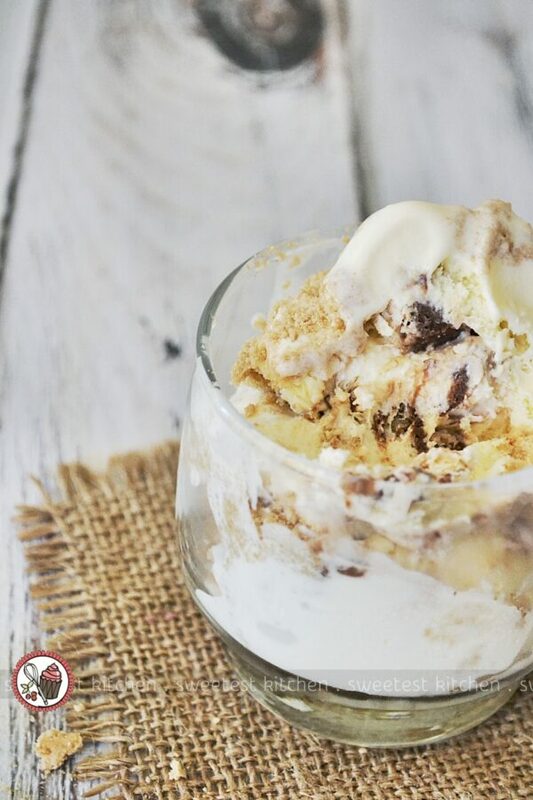 An easy, no-churn recipe for s'mores ice cream! Place a 2-litre freezer-safe container (I use a reusable plastic ice cream container, but you can also use a metal loaf tin) in the freezer until ready to use. Place the chopped chocolate in a small bowl. Heat the cream in a small saucepan over medium heat until just before boiling (do not let boil). Pour the cream over the chocolate and stir until completely melted and smooth. Refrigerate for 20 minutes to cool. Meanwhile, heat marshmallows and milk in a medium saucepan over low heat and stir until melted. Remove from heat and set aside. Transfer the ice cream to the bowl of a stand mixer and beat on low speed until softened (but not melted). 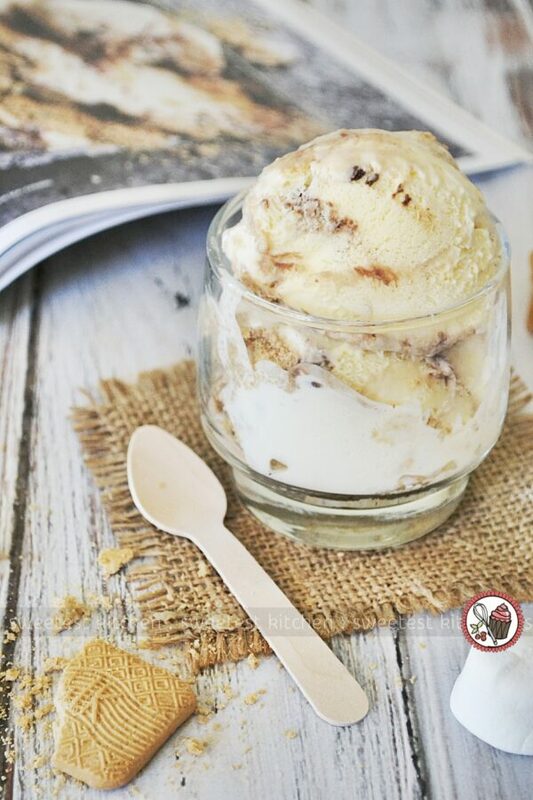 Working quickly, add the marshmallow mixture, chocolate ganache and biscuit crumbs to the ice cream and fold gently with a big wooden spoon or spatula a few times to get a swirly look. Make sure it's only just swirled through and that you still have globs of marshmallow and ganache - you don't want to completely mix these in. Transfer the ice cream to the pre-chilled container and freezer for 2-4 hours or until set. Will keep in the freezer for 4-5 days. Use graham crackers if they are available where you live. In Australia, we have to use alternatives such as malt biscuits! 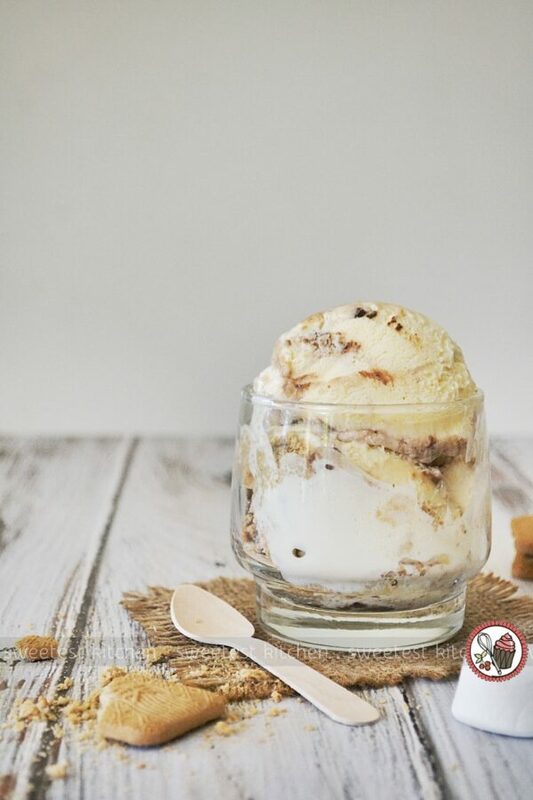 What a fabulous recipe, I love that you start with store bought vanilla ice cream — how easy! I’m up for something refreshing so I want this ice cream! It looks gorgeous and delicious!